The recently completed Fed study looked at millions of mortgage applications, and it found that flunking the debt-to-income (DTI) test is the No. 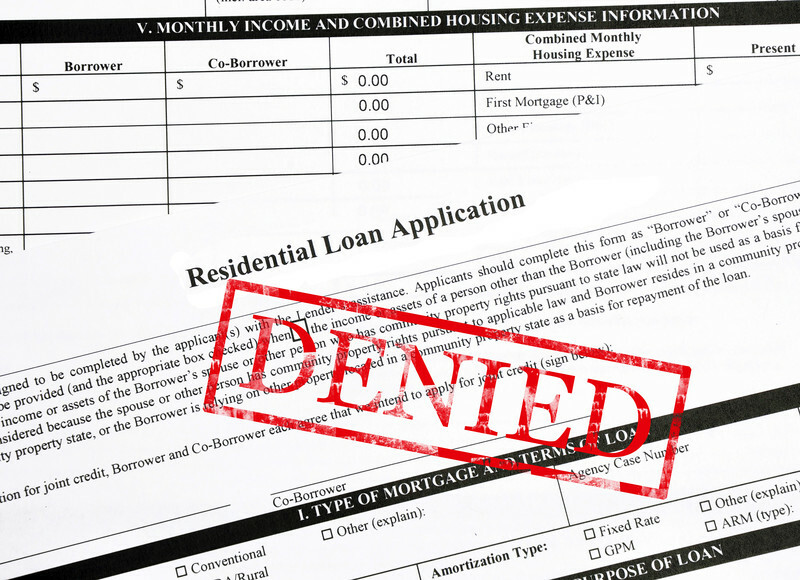 1 reason why loan applicants get rejected. No. 2: Issues over credit histories and scores. No. 3: Property valuation problems, such as buyers signing up for a house at a price higher than the actual market value. The study tapped into the databases compiled annually from mandatory reports filed by lenders nationwide to the federal government regarding mortgage applications. During 2015, according to researchers, one of every eight home purchase loan applications (12.1 percent) ended in a rejection. Denials were higher for borrowers seeking government-backed loans (FHA, VA, U.S. Department of Agriculture) at nearly 14 percent, and lower for those applying for conventional mortgages eligible for purchase by investors Fannie Mae and Freddie Mac (10.8 percent). Turndowns because of excessive DTI ratios accounted for nearly a quarter of all denials (23.4 percent); credit issues were connected with 20.4 percent; concerns over property valuations contributed to 13.7 percent. Debt-to-income ratios are crucially important to lenders. If yours is too high it suggests that you’re reaching beyond your ability to repay the loan; you’ve got too heavy a monthly debt load and not enough household income. Say you have $6,000 a month in verifiable income, but your auto loans, credit cards, student loans and other monthly credit obligations come to $1,000. If the mortgage you’re seeking will cost you $2,500 a month in principal, interest, taxes and insurance, your total monthly debt obligations will eat up 58 percent of your income, a DTI of 58.3 percent. That’s way too high for most lenders and not a smart idea for you personally. You’re likely to be turned down. Far better if your income is $7,000 a month and you apply for a mortgage requiring lower payments, say $2,000. Now your DTI is 42.8 percent, which squeezes you just under the federal 43 percent eligibility cutoff for a “qualified mortgage.” Fannie Mae and Freddie Mac may allow you to go to a 45 percent DTI and FHA can stretch the limit a bit higher, but the fact remains: The lower your overall DTI, the safer you look to the lender and the less likely you’ll be rejected. Joe Petrowsky, a mortgage consultant with Right Trac Financial Group in Manchester, Conn., said student loans are major DTI killers that he sees with many applicants. “They’re a huge issue” for first-time buyers because they get factored into monthly debt loan calculations and, in the case of FHA loans, even when payments are in deferred status. Credit issues are in the same killer category. If there are serious dings on your credit reports because of late payments, and your FICO credit scores are depressed as a result, your application could be doomed at the gate. Of particular concern here: High “utilization” of your available credit. If you’ve got a $3,000 maximum limit on a credit card, don’t let your unpaid balance get much beyond $1,000 (33 percent) or your score could suffer. Gene Mundt, a mortgage originator with American Portfolio Mortgage Corp. in Palatine, Ill., said credit reports and scoring are such mysteries to so many borrowers that it’s best to contact a loan officer four months before submitting an application. That way, he told me, “there’s enough time to work on and correct” whatever problems could eventually lead to a rejection. Appraisal issues might seem to be beyond a home buyer’s direct control; the lender hires the appraiser, not the buyer. But there’s one thing that you can avoid, getting sucked into a bidding war that pushes the contract price beyond true market levels. According to valuation and analytics firm CoreLogic, 11.3 percent of home purchase appraisals ordered through that company’s widely used system came in below the contract price. Mundt’s blunt advice: “Don’t be the ‘winner’ in a bidding competition” that gets so out of line that it ultimately causes the mortgage financing to fall through. That’s called losing. Copyright 2016 © The Boston Herald. Distributed by Tribune Content Agency, LLC.